The Arboretum is located at the University of Guelph in Guelph, Ontario. It was founded in 1970 and planting at the site began in 1971. The staff at the arboretum continue to develop specialized gardens, botanical collections and gene conservation programs. You can find labels at the base of all woody plants for easy identification. During your visit to the arboretum you can explore the 9 kilometres of trails, five feature gardens, different plant collections and various natural areas. The 165 hectares supports an amazing diversity of wildlife species. I had gone home to visit my family for the Easter long weekend and since it was such a nice day I suggested that we get out and take a walk somewhere. We decided that it would be nice to go up to the arboretum and look around. Once we had parked near the arboretum centre we headed down one of the trails to where some the feature gardens are located. 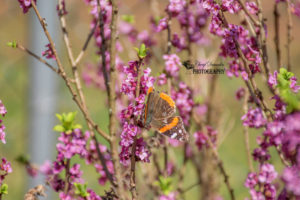 I noticed that there was a butterfly that was attracted to some of the flowers that had just started blooming. I was able to take some photographs before it flew away. We continued to walk through some of the surrounding gardens where I noticed a bed of daffodils that were in full bloom. 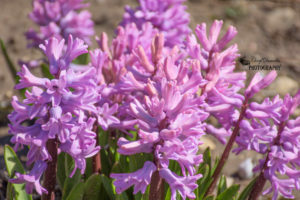 As I got closer I saw some honey bees that were busy pollinating the flowers. 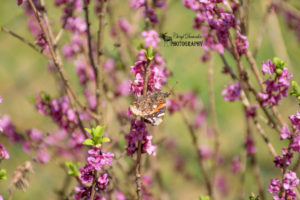 I positioned myself in front of the flowers and put my camera in focus while I waited patiently for a bee to land. 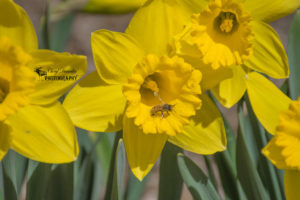 My patience paid off as I was able to capture one of the bees as it rested for a moment on the edge of one of the daffodils. Below are the photographs I took during my visit. 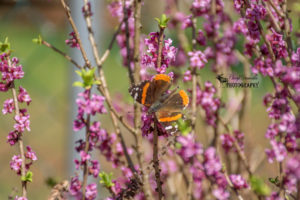 This entry was posted in Hiking Trails and tagged Arboretum, bees, butterflies, Camera, daffodils, flowers, gardens, Guelph, Nikon, Nikon D7200, ontario, outdoors, Photo, Photography, trail, University of Guelph, wildlife, wildlife photography.